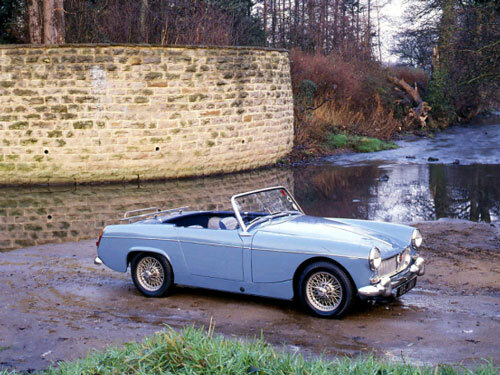 The MG Midget car revived the Midget moniker first seen with MG M Type Midget of the late 1920’s. It was based upon the successful Austin Healey (Frog Eye) Sprite but with significant body changes and similar Sprite versions continued alongside until 1971. During it’s life significant changes occurred including engine capacities rising from 948cc to 1493cc, with the most prolific being the 1275cc engined versions. The 1275cc BMC A series engine delivering a nominal 65 bhp was fitted between 1966 and 1974. This provided the car with brisk performance for the period allied to very nimble handling that made the car a very quick A to B car, on roads that were still mainly single carriageway with plenty of twists. The 1275 engine when originally introduced to the Midget was a leading edge engine, and was very similar to that which was powering the legendary Cooper S to many sporting victories. This also meant that there was a huge reserve of untapped performance potential that many owners were keen to exploit. This is something that continues to today. The formation of British Leyland in 1968 initiated the same sort of cosmetic changes that had also been seen on the MGB for 1970, but the following year saw the arrival of what many regard as the best version that became known as the round wheel arch version. The title relates to the rear wheelarch shape, which up to then had been a square design and continued until 1974 when the 1275 was replaced by the 1500 version. Engine: Cast iron head and block. Valve operation: Pushrod overhead valve. Gearbox: 4 speed part synchromesh manual. Front: Coil and wishbone with hydraulic lever arm shock absorbers. Rear: Quarter elliptic with hydraulic lever arm shock absorbers. Brakes: Lockeed hydraulic, disc front, 7" drum rear. Track: 3' front. 3' 8" rear. Cost New 1963: £495 plus £103.13s.9d. tax.